The Muslim Brotherhood and "Free Halawa"
Death for gays. Death for apostates. 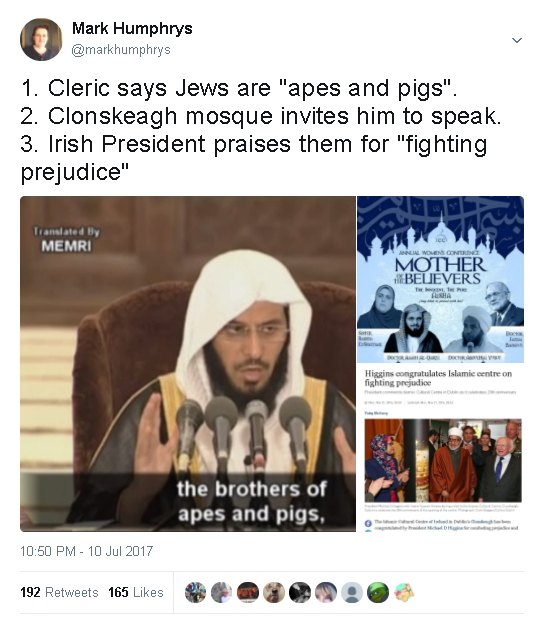 The Islamic Cultural Centre of Ireland (the Clonskeagh mosque in Dublin, the largest mosque in Ireland) is a reactionary Islamist mosque that is apparently linked to the Muslim Brotherhood. It seems to be the main Muslim Brotherhood centre in Ireland, and one of the main Muslim Brotherhood centres in Europe. The Muslim Brotherhood (founded 1928) is an extremist organisation devoted to the ideology of Islamism. It is the ultimate origin of a lot of the Islamic oppression and violence plaguing the world today. It is a disgrace that anyone living in Ireland would support the Muslim Brotherhood or the ideology of Islamism. The Clonskeagh mosque is a symbol of Ireland's failure to criticise and confront Islamic extremism. 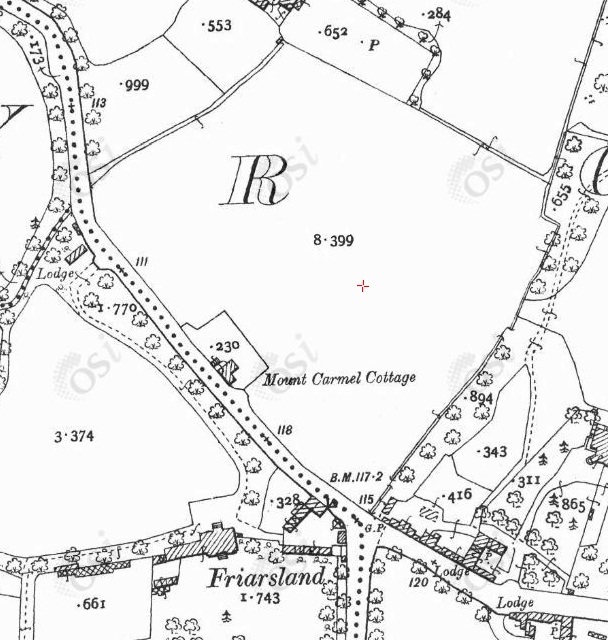 The Clonskeagh mosque site in the 1887 to 1913 period. Has Ireland got rid of one oppressive religion only to invite in another? See site and twitter and facebook and facebook. The Clonskeagh mosque is linked by almost all writers to the Muslim Brotherhood. See a list of such people below. See a watchable video summary of the evidence. Muslim issue will turn and bite us if we fail to act: It's time to show the Islamic Cultural Centre of Ireland tough love, Ruth Dudley Edwards, 11 November 2007. Or via here. UN list of people associated with al-Qaeda as at 2010 included two people in Ireland. Oddly, both of them worshipped at the Clonskeagh mosque. The ICCI was originally built and funded by the ruling family of Dubai in the United Arab Emirates. The UAE is a country with an appalling human rights record, being ranked year after year as "Not Free" by Freedom House. President Mary Robinson and the Deputy Ruler of Dubai officially opened the centre in 1996. Has Mary Robinson ever condemned the lack of freedom in Dubai? 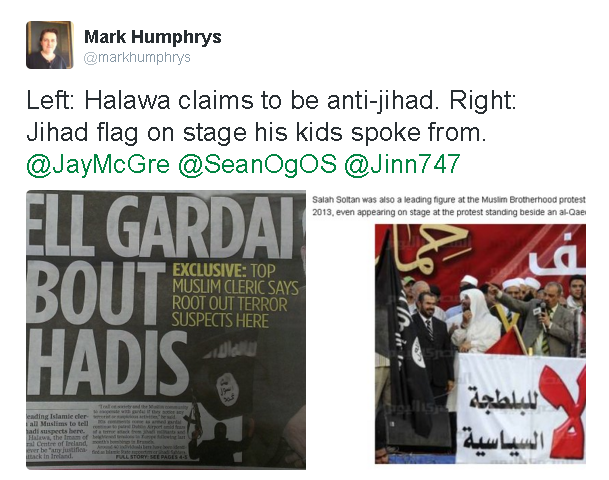 Some pro-Halawa leftists claim that linking Clonskeagh to the Muslim Brotherhood is a "conspiracy theory". Some even say that the conspiracy theory comes from my website. So this is for them. The Wall Street Journal, 2005. Irish Muslim leader Umar Al-Qadri, 2017. See below. Irish Muslim leader Shaheed Satardien, 2007. See below. Jim Cusack and Mark Dooley, Sunday Independent, March 6, 2005. Mark Dooley, Sunday Independent, February 12, 2006. Mary Fitzgerald, Irish Times, 6 Oct 2006: "Many Muslim Brotherhood members I met recently in Cairo asked me if I knew Sheikh Halawa after hearing I was from Ireland." 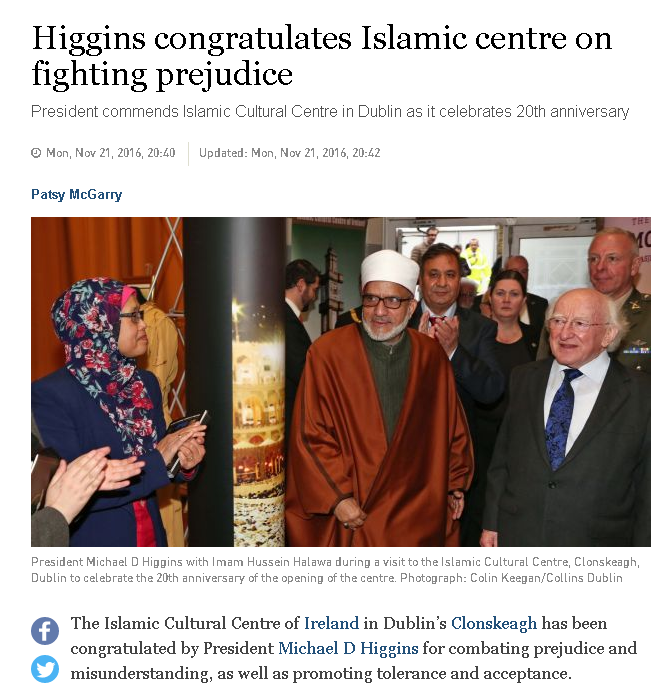 Mary Fitzgerald, Irish Times, 12 Feb 2011: "Many Muslims in Ireland speak of the ICCI as the "Ikhwani" mosque, an Arabic-language reference to the Muslim Brotherhood". Al Jazeera, 18 Sept 2017: "Ibrahim Halawa - arrested at age 17 ... is the son of a senior Muslim Brotherhood member". "Islam in Ireland: Organising a Migrant Religion", Oliver Scharbrodt, in Ireland's New Religious Movements, Olivia Cosgrove et al., 2011. Muslims in Ireland: Past and Present, Oliver Scharbrodt et al., 2015. 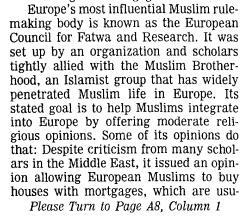 Aims and Methods of Europe's Muslim Brotherhood, by Lorenzo Vidino, The Hudson Institute, 2006. "FIOE sponsored the first meeting of the European Council for Fatwa and Research ... The Council�s headquarters are in Dublin, where it operates in conjunction with the local Islamic Cultural Centre. ... the Council is a body created and dominated by the Muslim Brotherhood�s global network. ... the president of the Council is Qaradawi, whose position of prominence is widely accepted by the other members." He discusses the ECFR's support for jihad terrorism. 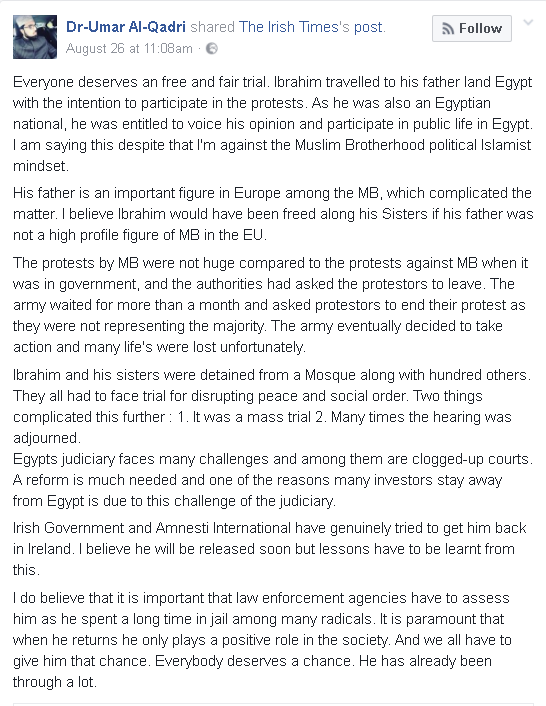 The Muslim Brotherhood in Ireland, by Steven Merley, June 2009. The Global Muslim Brotherhood Research Center. This says about Hussein Halawa of Clonskeagh: "Sheikh Halawa also has strong ties to the global Muslim Brotherhood." Notably the European Council for Fatwa and Research and the FIOE. It says about Nooh al-Kaddo of Clonskeagh: "Dr. Al-Kaddo has numerous ties to the global Muslim Brotherhood." He is a senior member of the Federation of Islamic Organizations in Europe (FIOE), the Europe-wide MB organisation. It says he supported the jihad in Iraq. 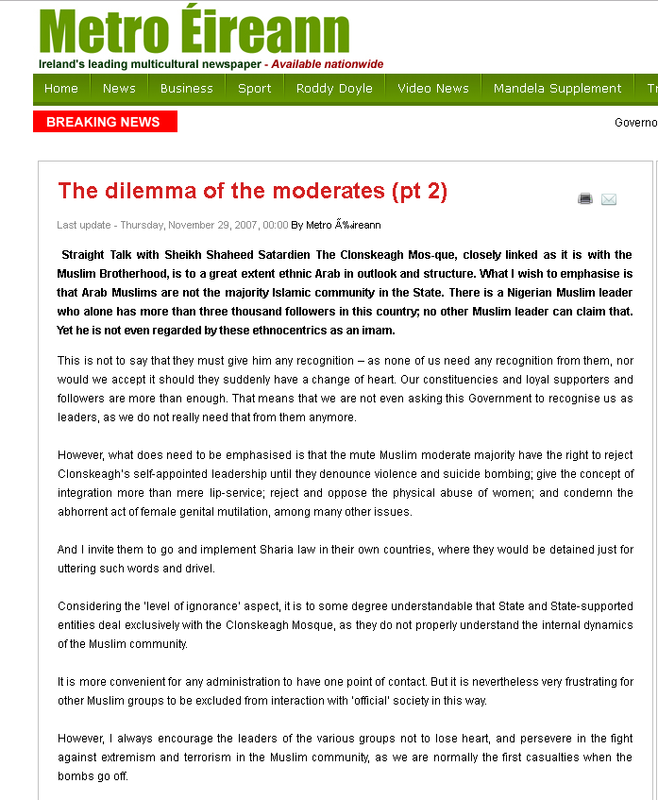 It lists many of the extremist Islamist speakers that Clonskeagh has hosted over the years. Shaheed Satardien says Clonskeagh is Muslim Brotherhood. So it's not just "Islamophobes" who say that. See wider screenshot. From 2007 article. Umar Al-Qadri says Halawa is Muslim Brotherhood. So it's not just "Islamophobes" who say that. See wider screenshot. From 2017 post on his facebook. Umar Al-Qadri departs from the left-wing script again, 23 Sept 2017. 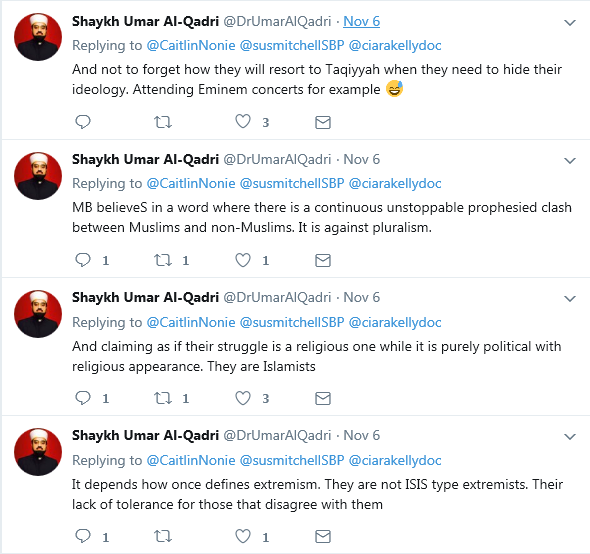 Umar Al-Qadri in Nov 2017, reacting to Ibrahim Halawa's claim on the Late Late Show that he planned to go to an Eminem concert but somehow ended up speaking on stage at a Muslim Brotherhood rally. Al Qadri says: "they will resort to Taqiyyah when they need to hide their ideology". He said it, not me. The official Muslim Brotherhood can be found linked to the "Free Ibrahim Halawa" campaign. 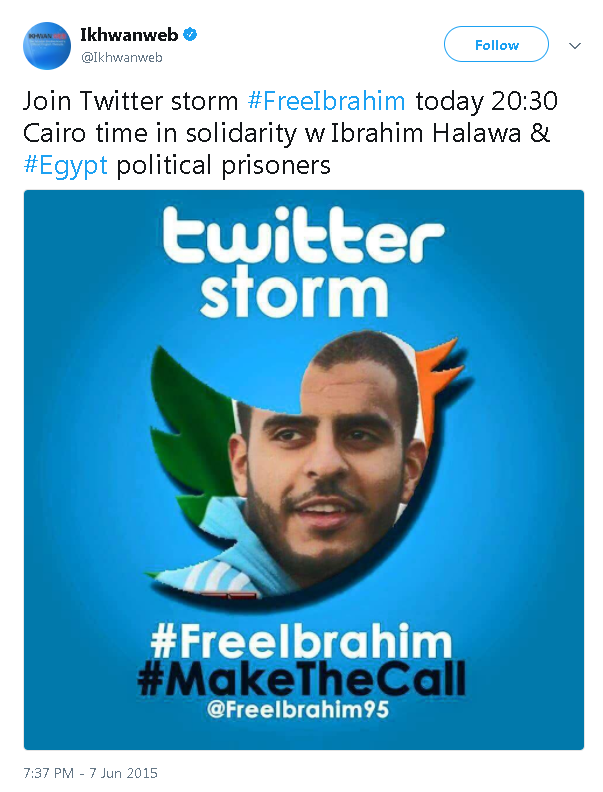 The official Muslim Brotherhood promotes the "Free Ibrahim Halawa" campaign on Twitter, June 2015. Somaia Halawa at a Muslim Brotherhood press conference in London, Nov 2015. From official Muslim Brotherhood website. The official Muslim Brotherhood website quotes Ibrahim Halawa, Nov 2017. He is one of the 26 Saudi scholars who issued the fatwa in 2004 calling for holy war against the Americans in Iraq. "There is no doubt that the Jihad against the occupation is a duty of those who are capable of it." And this man was let into Ireland! He visited Clonskeagh in 2007. Egyptian cleric Wagdy Ghoneim (see here). He is a supporter of suicide bombing against the Jews: "Those young people who explode themselves to kill the Jews were not committing suicide but jihad." He is banned from the UK and Canada. Canada said he was a member of Hamas and the Muslim Brotherhood. And yet he was let into Ireland. And invited by the Clonskeagh mosque. He visited Clonskeagh in 2006 and 2007. Saudi cleric Aid al-Qarni (see here). Aid al-Qarni has a long history of anti-semitic and pro-jihad statements. See screenshot of some of his hatred. 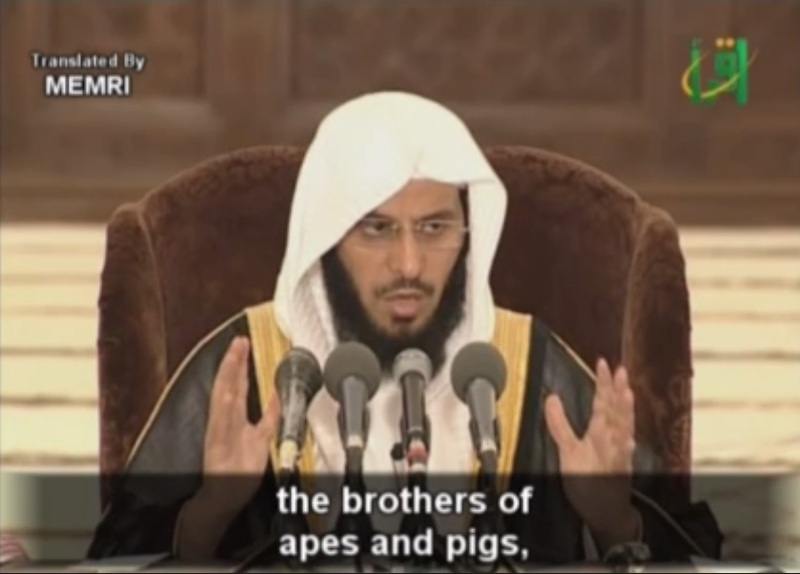 In 2005, he said the Jews are "the brothers of apes and pigs". In 2004, he paid tribute to Hamas jihadists killed by Israel: "Allah be praised, [Abd Al-Aziz Al-Rantisi] was killed by the brothers of apes and pigs .. He fulfilled his duty � he and Sheikh Ahmad Yassin, Allah's mercy be upon them. But we Muslims should be rebuked. .. We are incapable of taking action, of being useful, of harming the Jews." In 2004, he praised the jihad against the Americans and British in Iraq: "I praise Jihad, sacrifice, and resistance against the occupiers in Iraq. We curse them .. and pray that Allah will annihilate them, tear them apart, and grant us victory over them... The Jihad in Falluja is a source of pride. .. We must sacrifice people like Abd Al-Aziz Al-Rantisi, Ahmad Yassin, and thousands of others. Houses and young men must be sacrificed. Throats must be slit and skulls must be shattered. This is the path to victory". 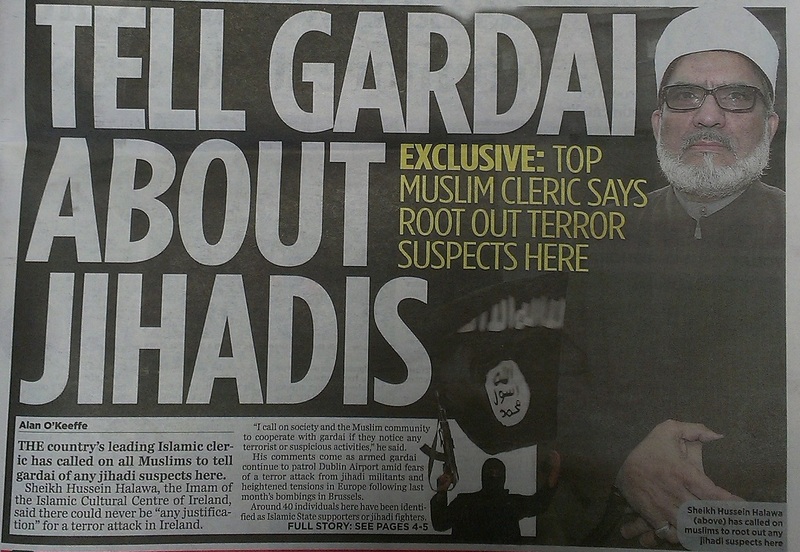 In May 2015, he was allowed into Ireland to speak at the Clonskeagh mosque. See poster from here. In Oct 2015, he called for knife attacks against the Jews. 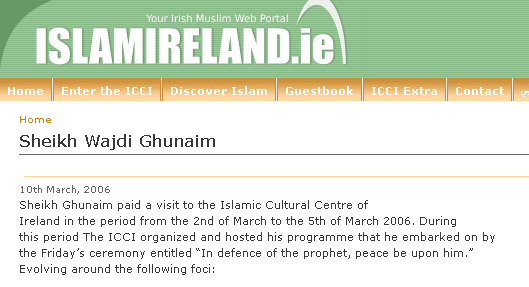 Anti-semitic hate preacher Salman al-Ouda spoke at Clonskeagh mosque in 2007. Here in 2012, he questions the Holocaust, attacks Jews, and says Jews use human blood for Passover matzos. He says: "The role of the Jews is to wreak destruction, to wage war, and to practice deception and extortion." Click to play. From MEMRI. See transcript. Muslim Brotherhood fascist Wagdi Ghoneim has repeatedly been invited to the Clonskeagh mosque. 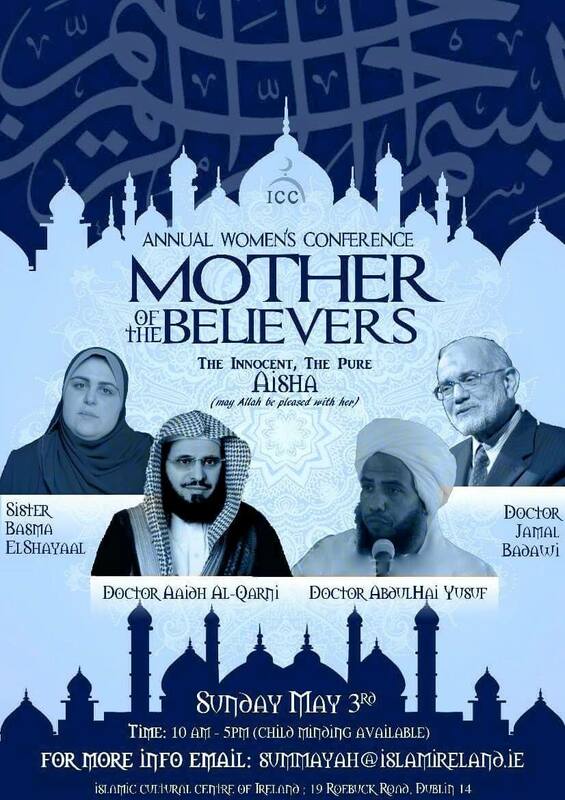 Saudi hate preacher Aid al-Qarni spoke at Clonskeagh mosque in May 2015. In this 2005 video, he calls the Jews "the brothers of apes and pigs". 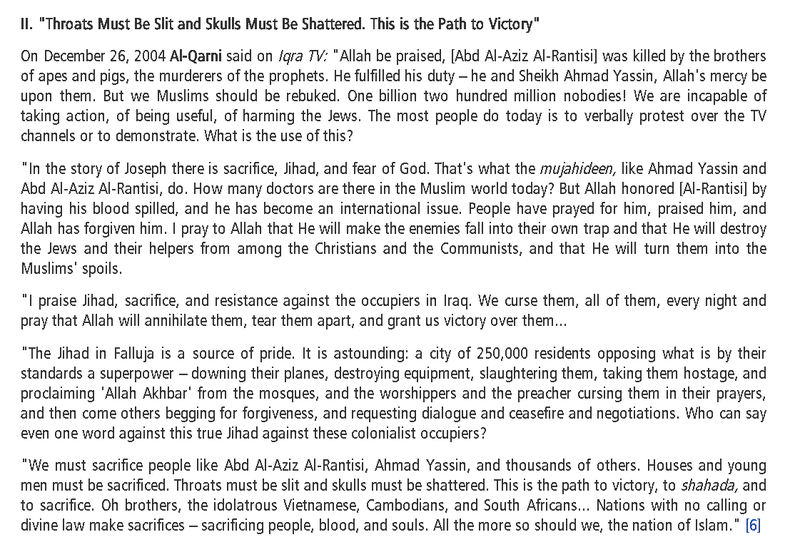 See also: Saudi Cleric 'Aed Al-Qarni: Throats Must be Slit and Skulls Must be Shattered; This is the Path to Victory (pay to view). "There is no such thing as democracy. Democracy is founded on principles of heresy. The ten principles of democracy constitute utter heresy: the freedom of religion, the freedom of belief - we have a punishment for apostasy ... In Egypt, there are 80 million citizens, only five million of whom are Crusaders ... They are a minority. A minority in a Muslim country has a certain status. Don't say everyone is equal. Don't tell me that every citizen enjoys equal and complete rights. Says who?! How can you possibly draw a parallel between the majority and a minority? ... There are 70 million of us! So how can you talk to me about equal rights? Whenever I build a mosque, he deserves to build a church?! Says who?" 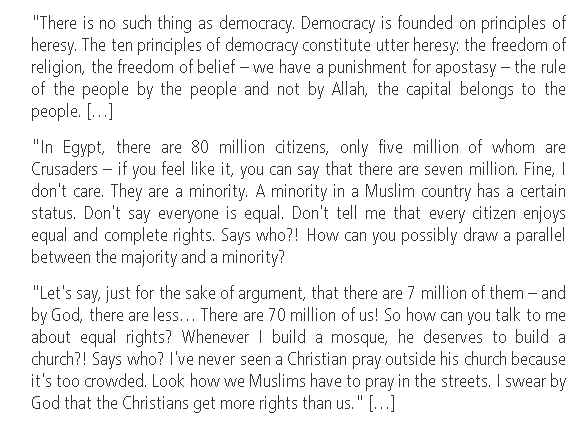 - Muslim Brotherhood fascist Wagdi Ghoneim, Aug 2011, attacks democracy and freedom of religion. And he supports the oppression of the Coptic Christians in Egypt. See image. Wagdi Ghoneim has repeatedly been invited to the Clonskeagh mosque. He appears on Halawa social media. Hussein Halawa, Imam of the ICCI. YouTube videos. Can any Arabic speaker translate any of these? Hussein Halawa was quoted by Eoghan Harris in the Sunday Independent, 17 Oct 2004, as saying he would like to see Ireland as an Islamic state. Halawa wrote a letter on 31 Oct 2004 denying he ever said this. But "I have never made such a statement" is not much of a denial. I would like to see him go further and state clearly that he is opposed to an Islamic state because he believes in freedom of religion for all, including atheists like me. I don't threaten his religious freedom. I want to be confident that he does not threaten mine. [US diplomatic cable, 2005] is sceptical about Halawa: "Post welcomes Halawa's public statement condemning the 7/7 attacks and terrorism in general, but remains unconvinced that Halawa will take strong steps to fight extremism. Despite Halawa's statement, and the center's reputation as a moderate mosque in Dublin, we retain some suspicions about his activities and can confirm that there are known extremists that frequent ICCI". Mary Fitzgerald in 2006 finds Halawa is apparently linked to the Muslim Brotherhood: "Many Muslim Brotherhood members I met recently in Cairo asked me if I knew Sheikh Halawa after hearing I was from Ireland." 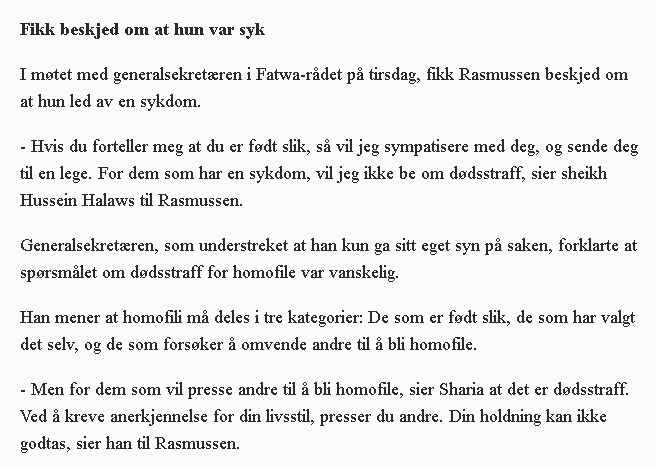 Norwegian media report in 2011 said that Hussein Halawa said homosexuality is a disease. It said he supports the death penalty for activist gays. Journalist Susan Mitchell did two interviews with Hussein Halawa in the Sunday Business Post in Oct 2017. She made a good attempt to ask questions. She got no answers. First interview: 8 Oct 2017. Second interview: 15 Oct 2017. Open question to Hussein Halawa: Can you please state openly that you believe in freedom of religion, including the right to be an atheist, and including the right of a Muslim to convert from Islam to atheism? In particular, you need to condemn the Islamic states that punish apostates. And you need to explain why you have not condemned this before. Let me know the answer here. Conspiracy theory: Hussein Halawa says Islamic terrorist attacks on tourists in Egypt are probably fakes, caused by "paid agents". He blames "the hidden hands of the enemies of Egypt". From Visa Is a Pledge of Security, "Sheikh Hussain Halawah, European Council for Fatwa and Research", 26 April 2006. Hussein Halawa is interviewed by the DCU Talking Heads project on 6 Mar 2012. Also here. They do a great job of asking him some hard questions. Better than the mainstream media! (I got the feeling they got some of the questions from this site.) But he evaded the answers. Little was learnt. He can't speak English, so it is very hard to cross-examine his evasive answers. He claims to condemn terror, but does not condemn Palestinian terror. He also seems vague on whether Muslims carried out 9/11 and other acts. He is asked about Sara Azmeh Rasmussen, who the DCU person has actually been in touch with. Great research! He claims the Danish cartoonists should be "held accountable" in some vague, but threatening way. We get vague honeyed words about no "compulsion" in religion. But he never condemns the application of sharia law in Pakistan, Iran, Gaza, Sudan, Saudi Arabia or Egypt. It seems highly unlikely that he is opposed to this. Hussein Halawa is Secretary-General of the European Council for Fatwa and Research, based at the ICCI at Clonskeagh. The ECFR was headed until 2018 by the top Sunni Islamofascist Yusuf Al-Qaradawi. Among other disgusting beliefs, Al-Qaradawi supports suicide bombing of civilians, a Holocaust of Jews, explicitly rejects freedom of religion, and supports death for atheists and homosexuals. Sheik Yusuf al-Qaradawi: Theologian of Terror, by the Anti-Defamation League, has more on the ECFR. "Theologian of terror" held radical Islamic council session here, Jim Cusack and Mark Dooley, Sunday Independent, 6 Mar 2005. The 'sheikh of death' must be barred, Mark Dooley, Sunday Independent, July 17th 2005. - "Yusuf al-Qaradawi is banned from entering the United States and will soon be barred from Britain. If Minister McDowell is serious about combating Islamic fanaticism here, he must follow suit by ensuring that the "theologian of terror" is permanently prevented from entering this State." Islamic extremists use Irish base to preach global hate, Mark Dooley, Sunday Independent, 12 Feb 2006. Yusuf al-Qaradawi invited to Clonskeagh mosque, June 2011. Yusuf al-Qaradawi banned from Ireland, Aug 2011. Al-Qaradawi is banned from entering the US, the UK and Ireland because of his support for violence and terror. Europe's Fatwa Factories by Soeren Kern, February 3, 2011: "The European Council for Fatwa and Research (ECFR) is the most influential fatwa council in Europe. Based in Ireland, the ECFR is chaired by Yusuf al-Qaradawi, a demagogic Egyptian Islamic scholar, and an intellectual leader of the Muslim Brotherhood. Al-Qaradawi, who is also a spiritual advisor for the Palestinian terrorist group Hamas, has defended suicide attacks against Jews as "martyrdom in the name of Allah," and has been banned from entering Great Britain and the United States." The ECFR's Deputy Chairman, Faysal Mawlawi, supported suicide bombing of civilians. This group should have no place in Ireland. The ECFR should be expelled from Ireland. 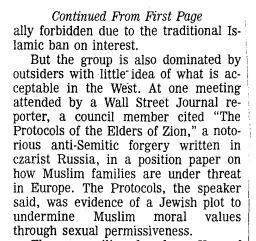 Article on the ECFR, Wall Street Journal, 4 Aug 2005. Says the ECFR is Muslim Brotherhood. Says the ECFR used the anti-Semitic forgery The Protocols of the Elders of Zion in its theological deliberations. 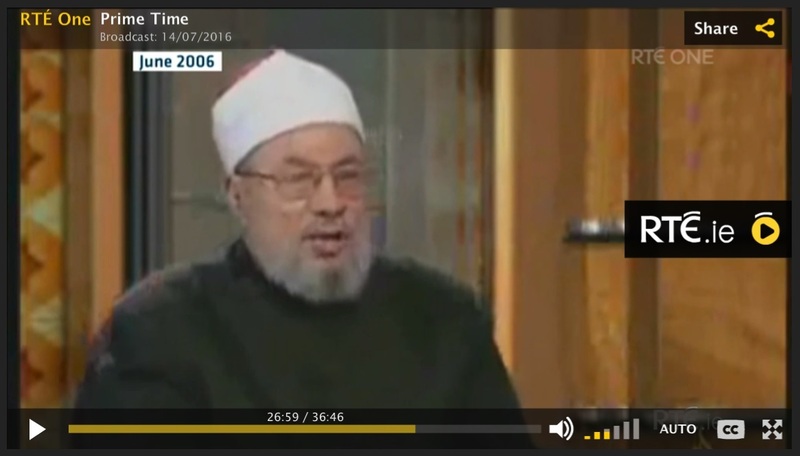 Yusuf Al-Qaradawi praises Hitler and the Holocaust. Al-Qaradawi was until 2018 President of the European Council for Fatwa and Research. Leading Muslim Brotherhood figure Salah Soltan (also spelt "Sultan") claims that the Jews kidnap people to use their blood for making bread. Salah Soltan is also a member of the European Council for Fatwa and Research. 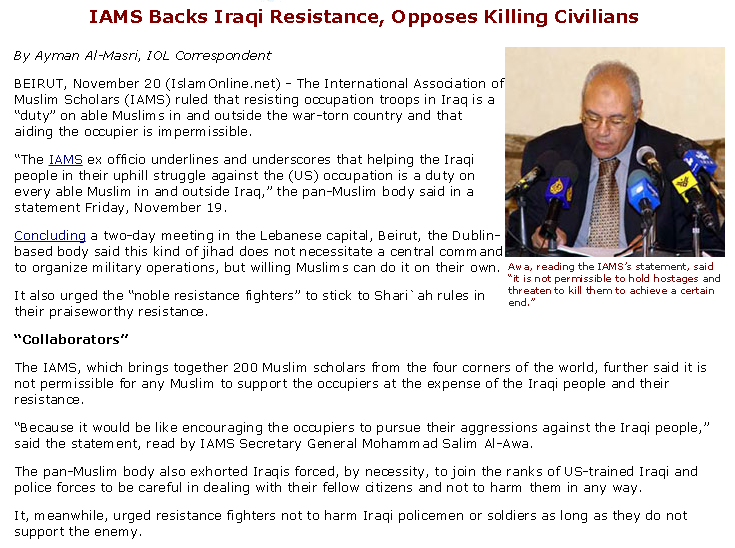 Qaradawi's International Union of Muslim Scholars (IUMS) issues a fatwa in 2004 calling for the killing of American troops in Iraq. Note that Ireland's good name is dragged into the mud by this vile jihadi group: "Concluding a two-day meeting in the Lebanese capital, Beirut, the Dublin-based body said this kind of jihad does not necessitate a central command to organize military operations, but willing Muslims can do it on their own." Ludicrous article, 7 Apr 2016, in The Herald, Dublin, claiming that Hussein Halawa is some kind of "opponent" of jihad. The European Council for Fatwa and Research (ECFR) at the Clonskeagh mosque is an outlet for the fatwas of Yusuf al-Qaradawi. 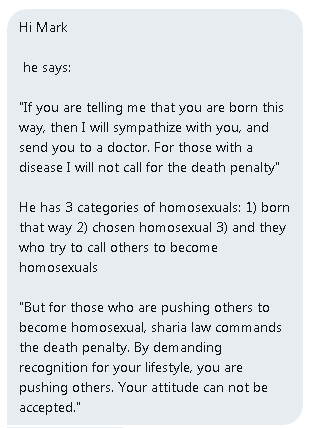 Yusuf al-Qaradawi's IslamOnline site produced these fatwas calling for death for gays and apostates. Would the Clonskeagh mosque like to clarify its position on these fatwas? The ECFR apparently calls for death for homosexuals. 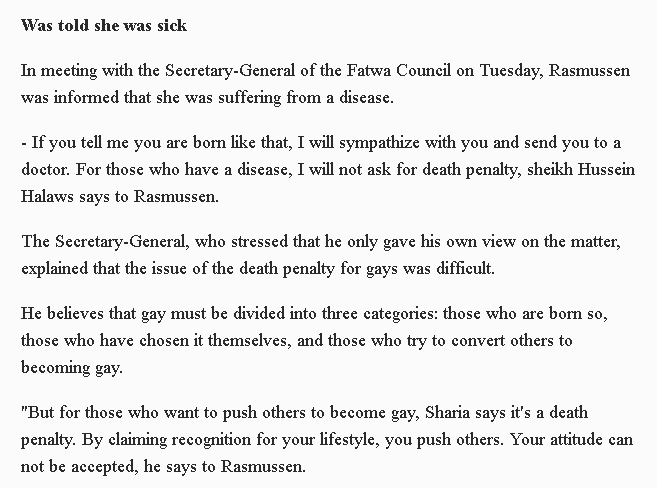 This Fatwa on Homosexuality and Lesbianism was published on Yusuf al-Qaradawi's IslamOnline in 2004. The ECFR apparently calls for death for apostates. This Fatwa on Apostasy was published on Yusuf al-Qaradawi's IslamOnline in 2003. [US diplomatic cable, 2006] says: "In conversations with emboffs, key integrationist Muslims and at least one journalist charge that ICCI answers to Al Qaradawi. ... In discussions with emboffs, the above-named pluralistic individuals and others have accused Halawa and other leaders at ICCI, and a smaller, more radical mosque, South Circular Road (SCR) Mosque and notably its Imam, Sudanese Yahya Al Hussein, of membership in the Muslim Brotherhood. Despite the historical and political connections that ICCI has with the GOI, other prominent Muslims deem that its teaching is influenced by Wahhabism with a close link to the ultraconservative Deobandi school of Islam (espoused by the Taliban). 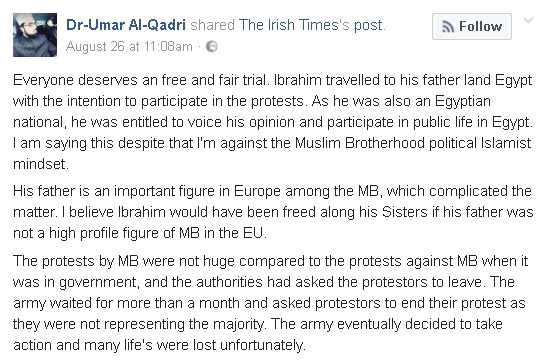 One journalist in town reported that other than in Qatar, the MB has its strongest base in Ireland, and charged that Al Qaradawi "runs Islam in Ireland." ... When queried in a May 23 interview by emboffs about the European role of MB, Halawa and Saleem failed to clarify their position regarding the organization ... When pressed on Yusuf Al-Qaradawi, they demonstrated loyalty to him by claiming that he is a model of moderate Islam". It says that some members of the Clonskeagh mosque celebrated the kidnapping of Irish aid worker Margaret Hassan by Iraqi jihadis in 2004. (She was then murdered by the jihadis.) "When there are problems, such as when ICCI members were known to be celebrating after Margaret Hassan was kidnapped in Iraq, ICCI leadership attempted to disassociate itself from the issue." It says that some children at the Clonskeagh Muslim school mourned the death of Abu Musab al-Zarqawi in 2006. "when Ali heard that a small number of children at the ICCI Muslim school were absent from school and visibly sad when al-Zarqawi (a senior al-Qaeda member) was killed in Iraq, the Imams at the various mosques worked together to speak with the families and address the issue. Ali added that the notion to mourn the death of al-Zarqawi is not coming from the school, but instead from the children's families." ICCI responds vaguely to the leaked cables, Apr 2011. 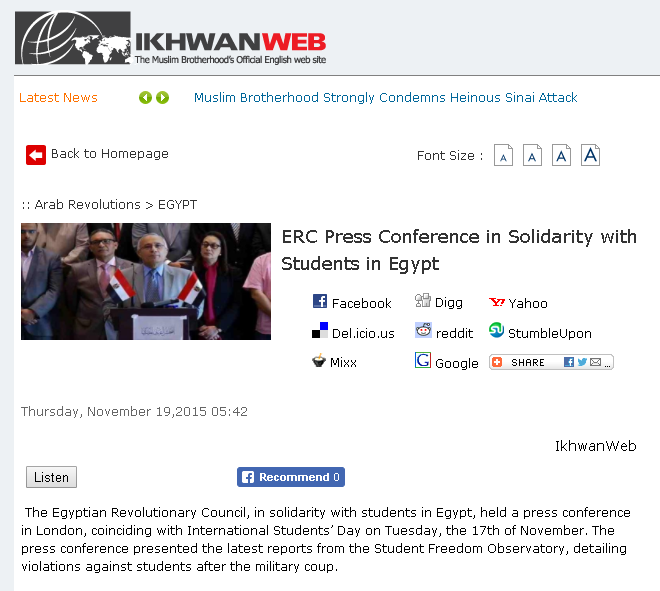 They do not firmly deny Muslim Brotherhood links. RTE Prime Time, on the Clonskeagh mosque, 14 July 2016, is a breakthrough. Clonskeagh's connection to the Muslim Brotherhood. Finally, after 10 years, the 2006 video of Qaradawi calling for death for gays is shown on Irish TV. See screenshot. Fair play to Richard Downes, whose previous work I had not been a fan of. RTE Prime Time, on the Clonskeagh mosque, 2016. The far-right religious conservative Ali Selim, general secretary of the Irish Council of Imams, is linked to the Clonskeagh mosque. In 2003 on the Late Late Show, Ali Selim apparently declined to condemn 9/11: "This is another political issue I do not want to touch." "Selim's Lot", interview, Hot Press, 1 Nov 2006. Ali Selim says he does not believe the London 7/7 bombings were carried out by Muslims: "events that happened in England - I personally haven't seen compelling proof that that was done by Muslims." Hot Press: "But the 7/7 bombers were Muslims!" "In my understanding, I haven't seen proof that those who did that were Muslims." He also expresses doubts about the standard theories of 9/11. He says he is against violence, but declines to judge Bin Laden as a terrorist, saying he would have to meet him and talk to him. He declines to say that people should have the right to draw cartoons of Muhammed in a free society. He declines to condemn the fatwa against Salman Rushdie. He defends Sharia law if the majority want it. He says about Iraq: "all the Iraqi people describe themselves as fighting against the occupation", which is nonsense. How about all of the Iraqi army and police, who are fighting with the occupation against the jihadis? He says: "So they see that they have no other alternative", which sounds like support for violence to me. If not, clarify this here. And they do have an alternative. They don't have to fight allied troops. They can simply vote for a party that asks for the occupation to end. Why didn't they? The answer is because they don't want the occupation to end. At least, not yet. He never has doubts about his belief in an invisible supernatural being: "Never! Never. Never. There is God, all the time. I find it really very strange if someone believes - or even thinks - that there is no Allah or there is no God." Maybe he should read a bit more. In short, he is at best a useless neutral in this global war. He will be of absolutely no use at all in this conflict. 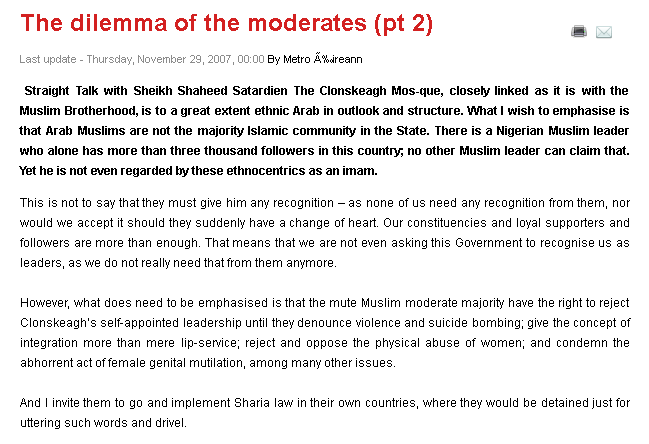 Ali Selim says that sharia law should rule Ireland if there is ever a Muslim majority, 24 Sept 2006. No other minority that I know of threatens our ancient freedoms like this. Only the Muslim community, apparently. If there is any other minority that has openly threatened our ancient freedoms in Ireland, let me know here. He claims that Muslims are the major victims of violence worldwide. Despite the non-stop killings by the jihad all over the world, every day since 9/11 (every day since the start of Islam in fact), he says: "Look to the east or to the west, or wherever you want to look, you will find that it is only the Muslim blood being shed everywhere." He refuses to condemn Bin Laden. "Well, I don't know him. Consequently, I can't say I respect or do not respect him." Yeah, we know where you're coming from. We understand you, even if Mary Fitzgerald doesn't. 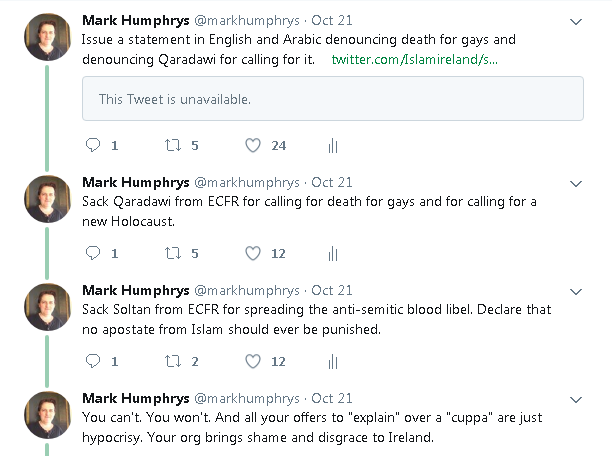 Ali Selim, 10 Feb 2014, supports the Irish blasphemy law using some comical double-speak: "Islam advocates freedom of expression. ... According to Islam, God, angels, holy scriptures, prophets, disciples or companions and places of worship are to be protected by the state against any publication or utterance of blasphemous matter. ... Islam is pro-freedom of expression ... Mocking at religious values should not be tolerated." Ali Selim, Jan 2015, shows his true colours again. After the Charlie Hebdo jihad massacre, Ali Selim threatens legal action if anyone in Ireland prints a cartoon of his alleged "prophet". He says: "definitely we will check the Irish law and if there is any legal channel against you, we will take it ... you can't portray the Prophet Mohammed." He comically adds: "I am a great advocate of freedom of expression". Actually, I think there is no legal action that any private citizen can take on this issue in Ireland. Only the state can prosecute. When asked to condemn Islamic terror, June 2017, Ali Selim condemns US and Israel. See bottom of this article. Ali Selim supports Female Genital Mutilation, Feb 2018. Open question to Ali Selim: Can you state that all Muslims in the world should have the right to freely convert to any other religion, or to atheism, without fear. Can you state that everyone in the world should have the right to criticise Muhammed. Can you state that everyone in the world should have the right to draw cartoons of Muhammed. Can you state clearly that Salman Rushdie has the right to publish his book, even if you think it is rubbish. Let me know the answer here. Ali Selim of the Clonskeagh mosque supports the blasphemy law, RTE, Prime Time, 12th January 2010. And see part 2. He welcomes the law, and threatens our freedoms more: "I would be more delighted to see it going further and further. But it has taken the first step" [to enslaving Ireland under sharia]. Talking about Islam, he says: "We don't impose it on others", but then hypocritically says: "all that we ask others to do with it, do not degrade it, full stop." "If you say something offensive about my prophet, it's something that is definitely not going to be tolerated." Ali Selim, quoted on 14 Mar 2010: "Thank you Ireland for the recent blasphemy legislation." I asked Ali Selim directly, 6 Sept 2014. I got no proper answer. Ali Selim, Sept 2014, launches a book promoting Islam in schools. Andrew McGrady, director of the Catholic Mater Dei Institute, launches the book, and he says it is "a brave step" for a Muslim fundamentalist to promote Islamic fundamentalism in schools. 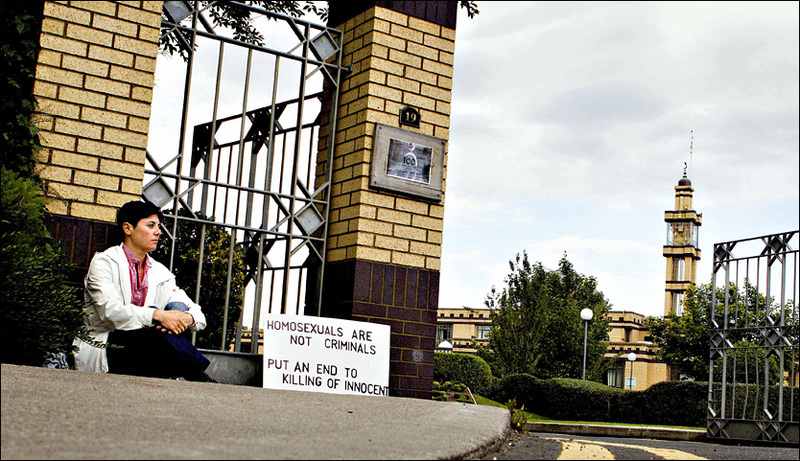 Heroically brave Norwegian-Syrian lesbian Sara Azmeh Rasmussen travelled to Ireland and protested outside the Clonskeagh mosque in June-July 2011. Why? Because it is the headquarters of the European Council for Fatwa and Research, which promotes the death penalty for homosexuality. Sara Azmeh Rasmussen's protest at Clonskeagh in 2011. From VG (Norwegian newspaper), articles of June-July 2011 (see links below). See 30 June 2011 article (and translate). Formerly here (and translate). See 2 July 2011 article (and translate). Formerly here (and translate). Rasmussen (of course) got threatened: "A mob gathered around me. They tore my sign from me, called me a pig, spat on me and threatened me ... A man threatened me. He said that of course I should be killed. Then he repeated it three times with pressure on the word kill." "Here in Dublin, many .. told me how sinful and unclean I am. Some have said that I must be sent by the Jews and Zionists. The woman who asked me to leave [said] that if I was born like this, there must be a punishment for the sins that my parents have done. ... It is precisely this attitude that creates the violent prejudices against gays in Muslim communities." blikk.no article, 28 June 2011. Extract from 2011 VG article on Hussein Halawa. "In a meeting with the Secretary-General of the Fatwa Council on Tuesday, Rasmussen was informed that she was suffering from a disease. If you tell me you are born like that, I will sympathise with you and send you to a doctor. For those who have a disease, I will not ask for the death penalty, Sheikh Hussein Halawa said to Rasmussen. The Secretary-General, who stressed that he only gave his own view on the matter, explained that the issue of the death penalty for gays was difficult. He believes that gays must be divided into three categories: those who are born so, those who have chosen it themselves, and those who try to convert others to becoming gay. "But for those who want to push others to become gay, Sharia requires the death penalty. By claiming recognition for your lifestyle, you push others. Your attitude cannot be accepted," he said to Rasmussen. Some Halawa fanatics disputed the auto-translate, so I sourced a Norwegian contact to translate it and this is the reply. It confirms the auto-translate is fine. Sara Azmeh Rasmussen burns the hijab, International Womens Day, Oslo, Norway, 2009. It is a wonderful thing to be free. Why does the left not support the liberation of Muslim women and gays? 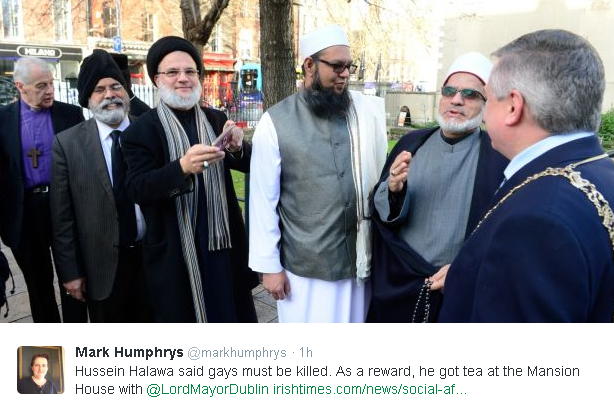 Despite being quoted in 2011 as saying gays should be killed, Hussein Halawa, head of the Clonskeagh mosque, is regularly invited to Irish state functions, and invited to deliver prayers at them. Hussein Halawa was invited to read from the Koran at the Nov 2004 Irish presidential inauguration (of Mary McAleese). The National Day of Commemoration commemorates all Irish people who have died in wars or peacekeeping. 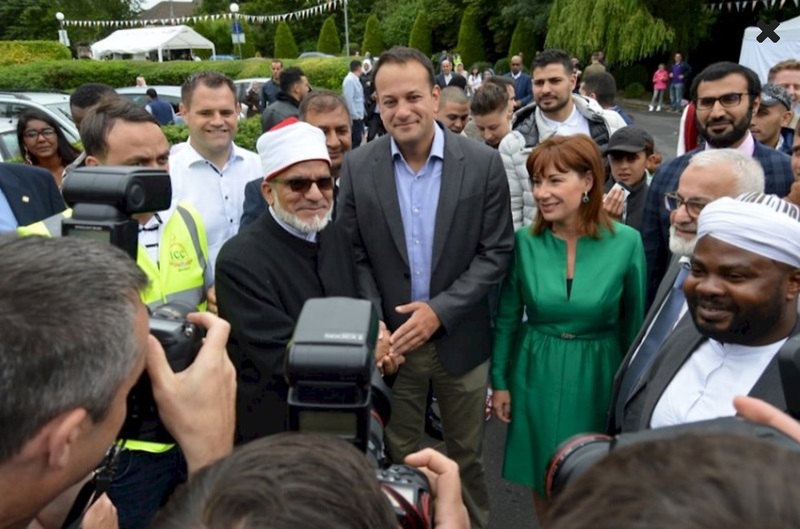 Hussein Halawa, of the Clonskeagh mosque, was invited to lead Islamic prayers at the 2014 ceremony, July 2014. Hussein Halawa leads prayers at National Day of Commemoration, July 2017. 2011: Hussein Halawa says gays should be killed. Nov 2016: Hussein Halawa hangs out with the President Michael D. Higgins. Saying gays should be killed is no barrier to getting invited to meet the Lord Mayor of Dublin at an "inter faith" event in Dec 2016. The Lord Mayor said: "I call on all to reaffirm our traditions of being an open society." Bad luck for the gays, though. June 2017: Hussein Halawa hangs out with the Taoiseach Leo Varadkar (who is gay). From here and here. Many more pictures. 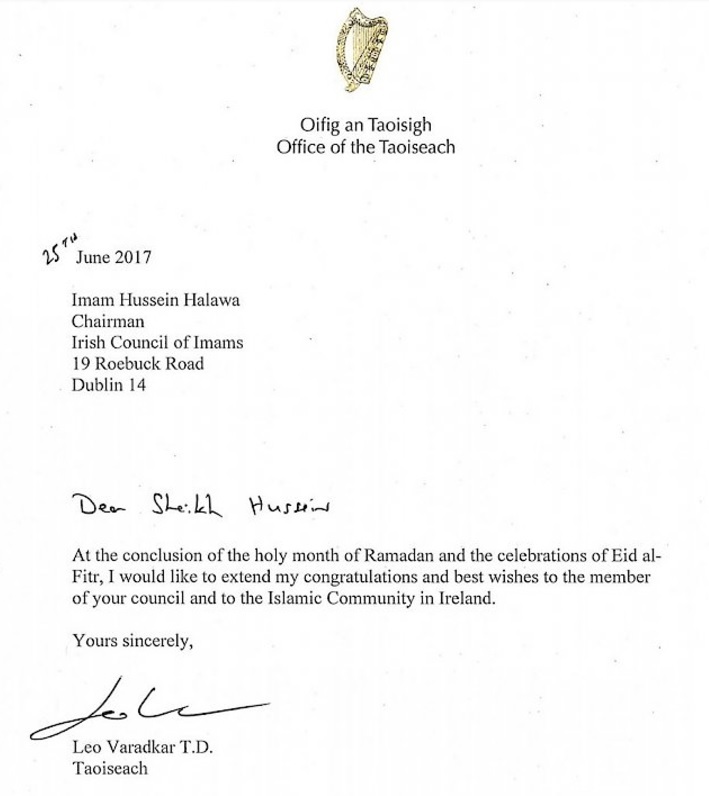 See friendly letter from Varadkar to Halawa. From here. It's nice to know calling for gays to be executed won't stop you getting visits and friendly letters from the Taoiseach. Varadkar met Hussein Halawa at Leinster House in July 2017. After years of silence, Clonskeagh mosque decided to engage with its critics in Oct 2017. It lasted 6 days. Someone at the mosque's Twitter decided to engage with their critics in Oct 2017. I issued the challenge above. I challenged them to denounce extremism and expel extremists from the ECFR. They made a few attempts at apologetics, and I thought we might get somewhere. But then they blocked me. This sums up the world of the Clonskeagh mosque - and its relationship with the Irish state.